Udderly Quiet™ Class A™ Corner Trap Studio Foam was designed to absorb low frequency sound. Udderly Quiet™ Class A™ Corner Trap is a triangular column, made of high quality acoustic foam that fits into room corners. The Corner Trap design enhances sound quality and aesthetics of a recording or listening environment. Bold vertical fluting adds architectural interest. Udderly Quiet™ Class A™ Corner Trap can be free standing or permanently mounted. Dimensions 1 ft. x 1 ft. Engineered for performance — Udderly Quiet™ Class A™ Corner Trap is a free standing, triangular column that fits into room corners. 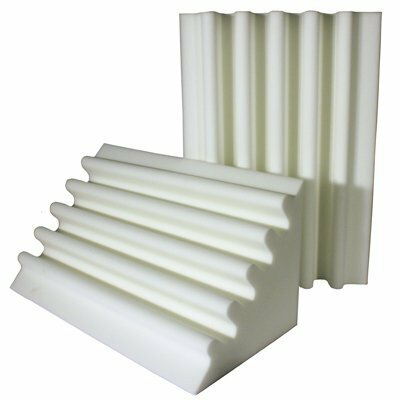 It is a thick melamine foam product with vertical fluting. The fluted pattern was designed to trap hard to control low frequencies. Quality — Udderly Quiet™ Class A™ Corner Trap Studio Foams are made from the highest quality melamine foam. This foam is consistent in density and firmness so acoustic performance will also be consistent. Ease of Installation — Udderly Quiet™ Class A™ Corner Trap Studio Foams are light weight and can be either free standing or mounted to a variety of surfaces. No special tools or materials are needed. Architectural Interest — The bold, fluted pattern of the Udderly Quiet™ Class A™ Corner Trap Studio Foams creates a visually unique and professional environment. Flammability — Udderly Quiet™ Class A™ Corner Trap Studio Foams are manufactured from melamine foam that has a Class A™ flammability rating. This product passes most building code flammability requirements for exposed materials. Not just for Professional Studios and Anechoic chambers — Udderly Quiet™ Class A™ Corner Trap Studio Foams can be used almost anywhere low frequency reverberation is an issue and strict flammability codes need to be met.